Since opening in August of 2013, Mamie Taylor’s has built its reputation on Chef Tobias Grignon’s contemporary comfort food and a thriving lounge and bar scene. It only follows, then, that Chinatown’s modern American restaurant offer a Southern-themed brunch, whether as an informal weekend stop-in or a much-needed and consoling pick-me-up for the day after the night before. Served from 11 am to 3 pm on Saturdays and Sundays (beginning Saturday, April 26), brunch at Mamie Taylor’s will introduce Vancouver diners to unique regional specialities direct from the America’s southern states. The Kentucky Hot Brown is inspired by its namesake, Louisville’s iconic Brown Hotel, where the hot sandwich of house-smoked confit turkey, tomato, crisp bacon and Mornay sauce has been welcoming weekend warriors since 1926. 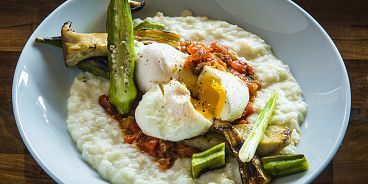 Egg and Grits, a staple south of the Mason-Dixon line, folds aged white cheddar into hominy grits. Topped with an egg and baked, it’s finished with tomatillo salsa verde, minced jalapenos, and scallions. Of course, no Southern-inspired menu would be complete without Chicken Fried Steak, served with charred green tomatoes and a drizzling of decadent white bacon gravy. The new menu will also feature classic brunch fare, jazzed up in Mamie Taylor’s signature down-home style. The Biscuit Benny (choice of Smoked Pork Belly with Apple Chutney or vegetarian Poblano Chili and Goat Cheese) is stacked on a lighter-than-air biscuit, then smothered and covered with Hollandaise. Cobb Salad boasts fresh peaches and a house-made Avocado Ranch dressing. With an ironic nod to Americana, Freedom Toast substitutes French toast’s brioche for pan-seared buttermilk biscuit and is served with a seasonal fruit compote, clabbered buttermilk ricotta and a crumbling of candied pecans. Co-owner and master bartender Ron Oliver has also curated a complementary cocktail list. The tongue-tickling Bloody Mamie boasts a secret spice mix and a “wicked” garnish of devilled egg and crispy chorizo, the Mamie Mimosa benefits from a shot of fresh passion fruit juice, and the gin-and-Cointreau-based Pegu Royale will make the perfect citrus sipper on the restaurant’s soon-to-be constructed outdoor patio. Planned as a true extension of Mamie Taylor’s interior, this outdoor space — scheduled for summer 2014 — promises to be the first of its kind in Chinatown.